Other showy exotics of the season. Now in bloom along the streets: bottle-brush plant (a shrub), Callistemon, posted about here; acanthus, posted about here; red valerian, posted about here. And just coming into bloom: agapanthus, posted about here. 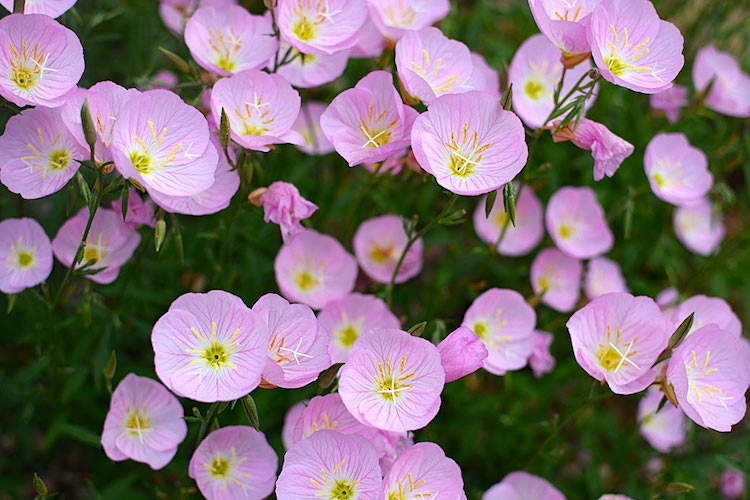 Oenothera speciosa is a species of evening primrose [evening primroses aren’t primroses, but (slightly) resemble them] known by several common names, including pinkladies, pink evening primrose, showy evening primrose, Mexican primrose, and amapola. It is a herbaceous perennial wildflower native to 28 of the lower 48 U.S. states … as well as Chihuahua and Coahuila in Mexico. It frequently escapes from gardens. The specific name, speciosa, means “showy”. The plant’s wild habitat includes rocky prairies, open woodlands, slopes, roadsides, meadows and disturbed areas. While it makes an attractive garden plant, care should be taken with it as it can become invasive, spreading by runners and seeds. This drought-resistant plant prefers loose, fast-draining soil and full sun. … It produces single, four-petaled, cup-shaped flowers on the upper leaf axils. These fragrant shell-pink flowers bloom throughout the summer into early autumn. Out my back door, on Forest St., they flourish as a sidewalk plant. Otherwise they’re used to fill in the centers of traffic circles. Very striking. Œ (minuscule: œ) is a Latin alphabet grapheme, a ligature of o and e. In mediaeval and early modern Latin, it was used to represent the Greek diphthong οι and in a few non-Greek words, usages that continue in English and French. … Modern American English spelling usually substitutes e, so diarrhœa has become diarrhea, although there are some exceptions, such as phoenix. In modern British English, the spellings generally keep the o but remove the ligature (e.g. diarrhoea). In Oenothera, it represents an /i/. Nerium oleander is a shrub or small tree in the dogbane family Apocynaceae, toxic in all its parts. It is the only species currently classified in the genus Nerium. 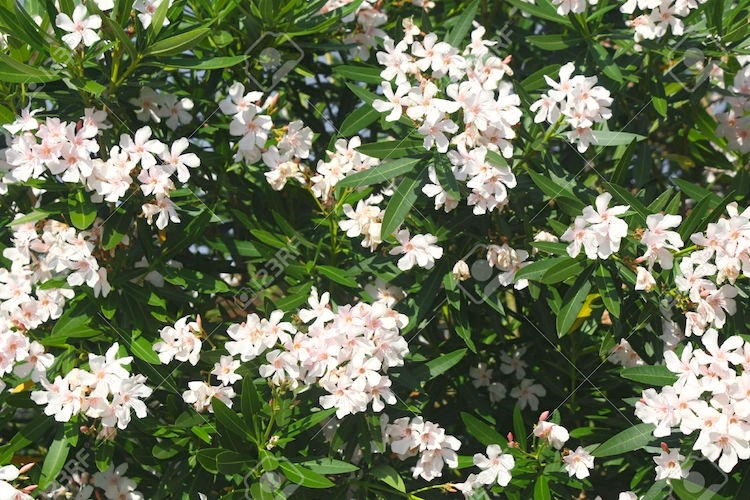 It is most commonly known as nerium or oleander, from its superficial resemblance to the unrelated olive Olea. 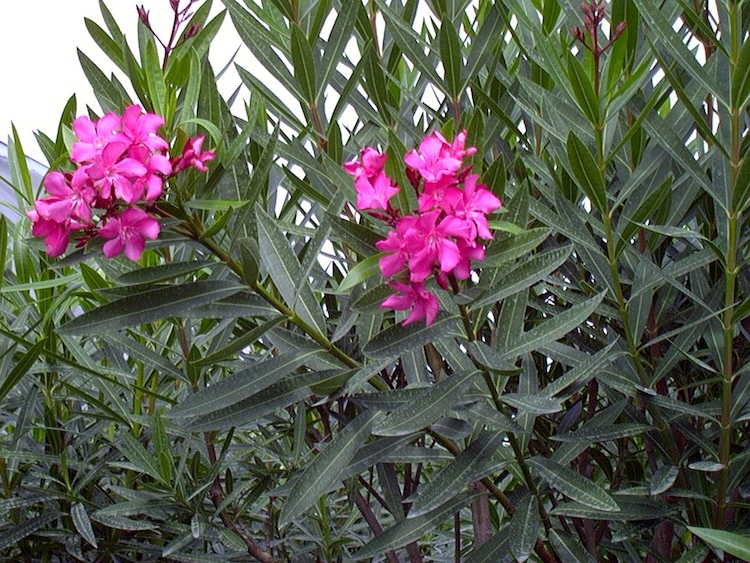 Oleander grows to 2–6 m (6.6–19.7 ft) tall, with erect stems that splay outward as they mature; first-year stems have a glaucous bloom, while mature stems have a grayish bark. … The flowers grow in clusters at the end of each branch; they are white, pink to red, … with a deeply 5-lobed fringed corolla round the central corolla tube. They are often, but not always, sweet-scented. 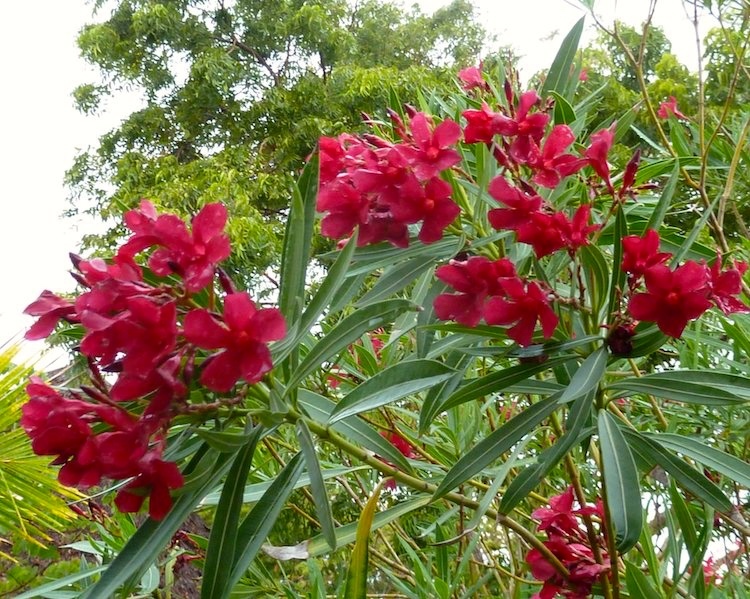 … Nerium oleander is planted in many subtropical and tropical areas of the world. 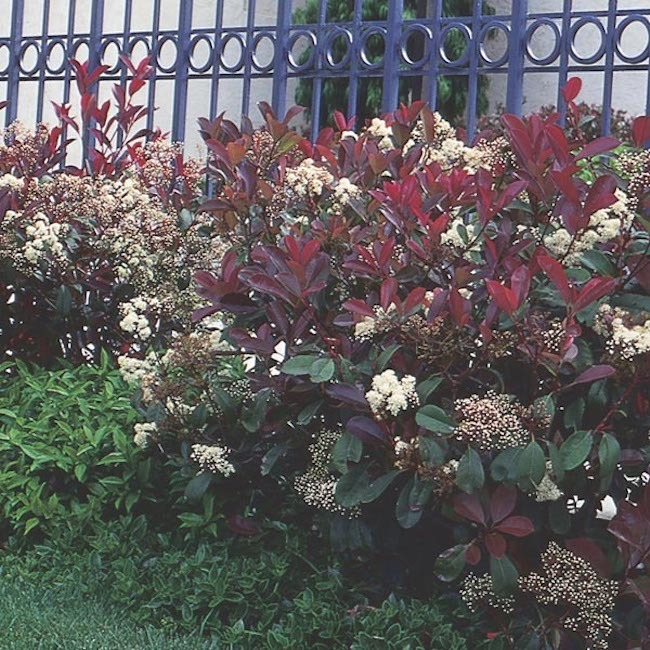 On the East Coast of the US, it grows as far north as Virginia Beach, Virginia, while in California and Texas miles of oleander shrubs are planted on median strips. Parking lot plants. The parking lot of my Ramona St. townhouse has a row of fancy hybrid tea roses (both pretty and fragrant) by the mailbox, plus a number of seriously tough plants that mostly need cutting back rather than nurture: wisteria vines, one well-clipped oleander shrub, and a lot of dwarf Photinia shrubs. They are a part of the rose family (Rosaceae)… The botanical genus name derives from the Greek word photeinos for ‘shiny’ [related to phōs ‘light’, as in phosphorus, stem phōt-, as in photograph, photon, etc. ; Photinus is the name of a genus of fireflies], and refers to the often glossy leaves. Most species are evergreen… The small apple-shaped fruit has a size of 4 to 12 mm and forms in large quantities. They ripen [to bright red] in the fall and often remain hanging on the bush until well into the winter. The fruits are used as food by birds, which excrete the seeds with their droppings and thereby distribute the plant. This entry was posted on May 28, 2017 at 6:37 am and is filed under Language and plants, Pronunciation, Spelling. You can follow any responses to this entry through the RSS 2.0 feed. You can leave a response, or trackback from your own site.